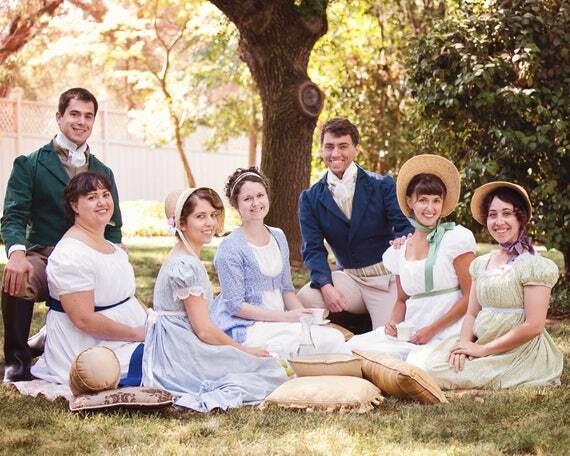 Home » Historical » 20th Century » Does Historical Accuracy Really Matter at Events? Trigger warning: this could get messy. Many costumers view historical accuracy as a sacred principle to be upheld at all times, and very often imposed upon other people. Others happily run riot in mass-produced synethics or mismatched ensembles in the vague manner of some era or another. Even a passing casual remark can cut deeply into someone who feels passionate about costume. Maybe they are still saving for a better outfit or had to rush to an event after a shift and had to compromise what they are wearing. This is an issue about individuals dressing up for costumed events and not the role of historical accuracy in reenactment societies – which is very significant and key to their existence. “Farb” is the term used to describe reenactors who are indifferent to authenticity despite its importance in this community. We’ve also tried to avoid complicating this issue with the role of historical accuracy in films. The most complicated matter is a reenactment when historical accuracy becomes the focus. While “official” reenactors are condemned as “farbs” for poor standards, should a paying member of the public have to dress accurately if they choose to dress up? A prime example is 1940s reenactments when, with the Retro fashion booming, many members of the public like to dress to the polyester-polka-dotted occasion often in a manner that is far from correct. Steampunks – or even broader “historical cosplayers” too fequently take advantage of similar historical weekends to parade their anachronistic finery but this too can anger reenactors trying to create an authentic atmosphere. This issue relates to whether visitors in costume should be allowed entry to museums that currently ban them. Historical sites are educational places and so even paying members of the public have to adapt to preserve this function. 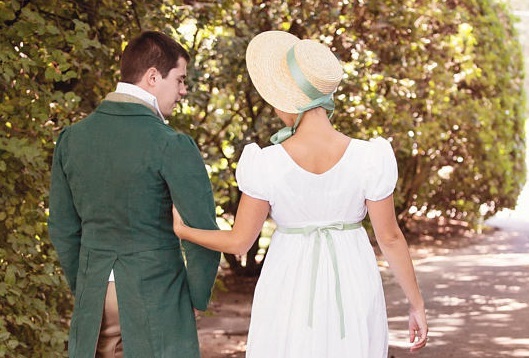 But even in places like this or reenactment occasions a member of the public should not be scrutinised for what they are wearing if they have attempted to embrace a theme, however successfully. 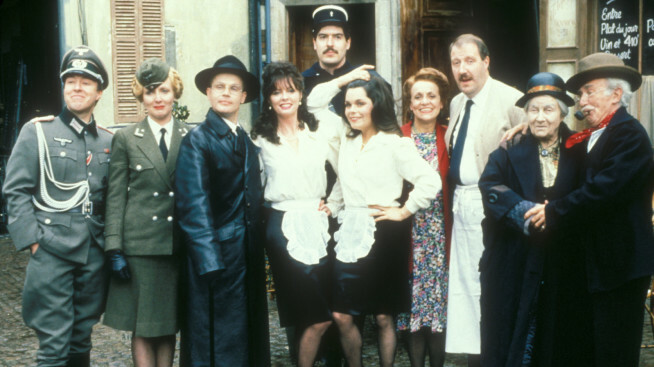 The conclusion is probably different if the members of the public have dressed in a way to make a spectacle of themselves such as ‘Allo ‘Allo (pictured) at a 1940s event that makes historical reenactment seem more like a theme park. Of course it also remains that members of the public should not wear anything offensive that are out of place with the setting, like Nazi uniforms to a homefront event. This 18th Century ball gown is far from accurate but could look the part. We should also consider a social occasion like a themed party, social or convention where there is no set dress code as such, but rather a general encouragement to dress up in a certain manner. This is a time when dressing “in the manner of” is perfectly acceptable. It is a modern event in which the purpose is to have fun but in a way that is more immersive than the average fancy dress party. There are few things in life better than drinking with like-minded friends in a costume. Recently the Royal Academy of Arts in London held a masque with a “courtly attire” dress code to celebrate its Charles I exhibition and while this was little more than an upgraded fancy dress party the effort was still impeccable in the vast majority of guests. More experienced costumers can dress to the nines in a specific decade should they choose to but equally many guests will come from a non dressing-up background and make do. Precious few of us can dream of having garments to fit every decade for each event we will attend and so being a century out now and then is still a good effort, especially if done well. Similarly many 20th Century events will attract people in very modern outfits so there is no need to call people up on the width of lapels and the weight of fabrics and so forth – even if you do secretly spurn them in your own mind. What about events that specify an extensive dress code as a condition of entry? Regency balls in particular use this approach to create as fully an immersive experience as possible. 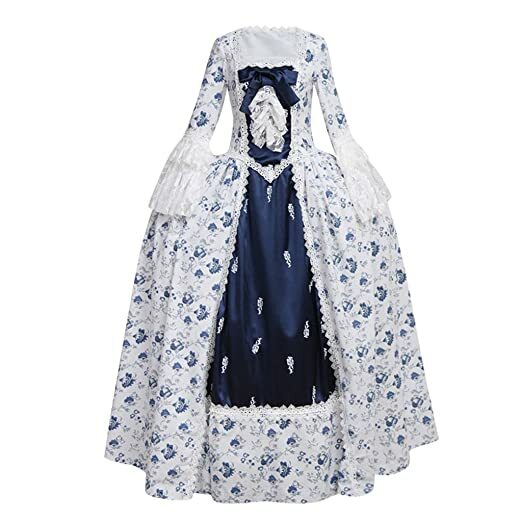 These guests have paid not just to have a laugh but to feel transported to another time and this is the whole point of the event and so hiring or commissioning an authentic costume is best. Online seamstresses like Thither Regency Shop (pictured + header image) mean this has never been easier, although bespoke remains prohibitively – if justifiably – expensive for most people. But even here if a guest were good enough to be in the know about the event and have made enough effort to get through the door then leave judgement with the door staff. Maybe they haven’t got properly made shoes yet and still rely on buckles attached to some modern ones, or perhaps there is a bit of polyester in their outfit. They are still here to have a good time and are doing the best they can. Like this topic? Join in the discussion about historical accuracy in our Facebook group.